Home Services Yard & Outdoor Health & Medical Auto Repair Family Life Beauty & Health Education & Schools Sports & Rec Pets Entertainment Shopping Restaurants Real Estate Legal & Financial Computers & Tech Home Decor Consumer Services Business to Business Govt & Community More Categories » Add your business for free » Spring Coupons! Rayford Road will be closed to through traffic, weather permitting, east of the Union Pacific Railroad, starting at 9 p.m. Friday, March 22, and lasting through the weekend until work is completed. Lanes in both directions will reopen by 5 a.m. Monday, if not sooner. 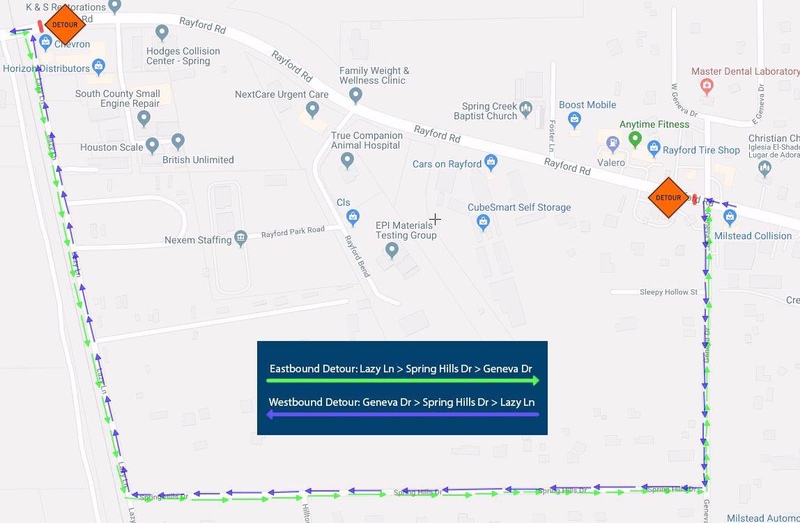 Eastbound traffic will be detoured to Lazy Lane, Spring Hills Drive and Geneva back to Rayford Road. While westbound traffic will be redirected to Geneva, Spring Hills Drive and Lazy Lane back to Rayford Road. Officers will be directing traffic at the intersections of Lazy Lane and Rayford Road as well as Geneva and Rayford Road throughout the closure. Your online community neighborhood for Spring-area residents.